Living in an RV supports an active lifestyle. You have to lift, hike, and generally move your body a lot more than sitting at the cubicle all day long. Which is really great, because you can count it as exercise on your little get-away. However, you will be collecting a lot of waste too, which you have to dump regularly and portable RV dump tanks are the best to work with when you don’t have direct access to full sewer hookups or a composting toilet. So, would you rather be right down by the beach – or up in the campground crammed in by all the other full hookups? What is a portable RV dump tank? When you are using the RV, you create two types of water waste — gray and black water. Gray water comes from the sink, shower, and the basin. On the other hand, black water is collected from the toilet. It holds both liquid and solid matter. It’s easy to attach the tank to your RV’s black water waste valve to a tank on wheels. Now you have what’s called a “portable black water tank.” It’s just a nicer way to say all those POOP words that are some much fun to say. When it is full, detach it, and go to the dump station to empty the contents. The stations have hand sprays that you can use to clean the insides. Pretty simple right? It is a convenient product and very easy to use. You can either use one tank for both types of water only two separate ones. We find using two tanks easier because you can use the gray water to clean out the black water tank after you empty it. That way, you save a lot of water. The only downside is that you will have to tow two tanks instead of one. How to use the dump tank? Wear gloves because your hands are going to get very dirty. Attach the portable tank’s sewer hose to the RV holding tank. Connect the gray water tank to the gray water valve and likewise for black water. Close the valve when the tank is full and tow it towards the dump station. Empty it and follow the cleaning process as mentioned by the manufacturer. Continue flushing the tank until no more wastewater or solid comes out of it. In case, the portable tank leaks when you are towing it, you might need a replacement because it is close to breaking. How to deep clean the portable tank? You will need to deep clean the portable tank every three months. Add a mix of bleach and water to the RV holding tank and empty it into the portable tank for 24 hours. Drain out the water completely and wash it with fresh water until the bleach smell goes away. Keep the tank open to air it as it reduces the bleach smell. You can add a few drops of treatment chemical to the tank before you connect it to your RV as it masks the foul smell of the waste contents it will hold until you clean it again. Limit how much water you use by using a small RV dump tank. You can measure how much water you use depending on the number of trips you need to take daily to the washroom. Also, many manufacturers make tanks using eco-friendly material. Make sure you buy only from such brands. You don’t want to not have a washroom in your RV and wait in line at a public restroom for 20 minutes before your turn. It is as hygienic as having your personal toilet. You have to dump it once a week but that’s all the work you need to do. Some dump stations have narrow openings, which means you can’t drive your RV close to the dump hole. When you have a portable dumping tank, you can detach it from the RV and pull it towards the hole. Invest in a good quality polyethylene or plastic tank, which will last you for a lifetime. It is also lightweight compared to metal tanks, which are also subject to cracking under pressure. Dumping tanks are either made for both types of water or separately for gray and black water. Read the product details before you purchase. When you use one tank for both, you will have to dump often. Using two tanks is a more eco-friendly option as you can use gray water to clean the black water tank. Portable tanks come with two wheels or four wheels. The latter option is easy to pull but it is the wheel material that matters the most here. Rubber is the best choice as it is durable and easy to clean. If you aren’t a full-time RV user, you can purchase a 30-gallon tank, which is sufficient for a three-night trip for two people. If you are living full-time, purchase anything that has a holding capacity of more than 40 gallons. 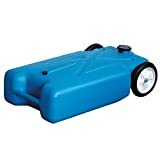 Camco 39002 Portable Holding Tank is a two-wheeled tote tank that is available in four different sizes, which include 15, 21, 28, and 36 gallon. It is a great choice if you are planning to use two separate tanks for gray and black water. It comes with a ready-to-use kit, which includes all equipment you need to tow the tank to the dumping station. The kit includes accessories to store, clean, and maintain the portable tank. Made with heavy duty blow-molded UV stabilized HDPE, the tank doesn’t break or deteriorate in the sun. All hardware is made of stainless steel and coated with zinc to make it durable and rustproof. Inside of the tank is smooth so that no waste material remains stuck. Its handle and rubber wheels are purposely made oversized for you to pull it effortlessly over a rough terrain. It has two water inlets on the top, one is for the integrated tank rinser, while the second one is for standard water hose with a male connection. A four-wheeler portable product, the Barker (30844) 4-Wheeler Tote Tank comes with a three-inch value that suctions the waste out and into the dumping hole. You don’t need to lift it to unload the contents. It comes in three sizes including 25, 32, and 42 gallons. The biggest tank of the range weighs 47 pounds when empty. You can use it fill gray water, black water, or both. Constructed using blow molded polyethylene, all hardware is made using stainless steel and aluminum coated with a thin layer of zinc. It protects the hardware from corrosion and extends its life. It has a front-swivel design that makes the tank easy to handle. When you purchase the product, you will get two years warranty on the tote tank, sidewinders, and power jacks. The tank arrives completely assembled, so make sure the package that you receive contains a filler hose assembly, heavy-duty tow handle, 3”x 5’ sewer hose, two 3” bayonet caps, two 3” bayonet hose adapters, full tank indicator, a 3/4” cap, and one full tank indicator. A compact 32-gallon tank, the Tote-N-Stor Portable Waste Transport is known for its brilliant design. When empty, it weighs around 28.4 pounds. It comes with an in-built compartment to store tote accessories. You can use it as extra wastewater storage along with the gray and black water tank, if you are planning to stay in one location for a long period. You will get a 3” drain hose, one hose clamp, and a tow bracket as standard accessories in the delivery package. The wheels aren’t pre-assembled but you can install using the kit provided by the manufacturer. It is also available in a variety of capacities including six, 11, 15, and 25 gallons. Available in four different sizes including 10, 15, 22, and 30 gallons, this tote tank is constructed using blow-molded polyethylene. The steel brackets are coated with a zinc layer to protect from rust and corrosion. Its heavy-duty large wheels assist in easy handling. It comes with a tow bracket and 5’ sewer hose. It is easy to wash, which you can do using the smallest size hose. You will have to purchase it separately. Unfortunately, the design isn’t dump-friendly, so not all contents empty out. You can use it only as an extra tank to fill wastewater in case you are staying in one place for a long time. Thetford’s SmartTote 2 RV waste tote is known for its versatile use. 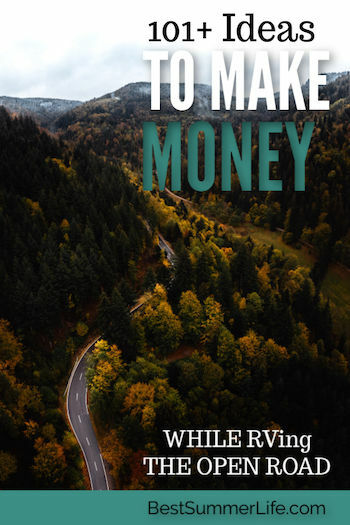 You can use it for any type of RV, small or big and it will work just fine. The 12-gallon tank has two rubber wheels, which make it easy to maneuver. 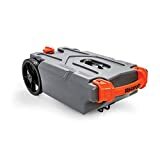 It comes with an additional tow strap that you can attach to your RV or car and pull it to the dumping station if you don’t want to carry it there. It is constructed using durable and high-quality rugged polypropylene. Its AutoStop level gauge prevents the tank from overflowing and helps in better ventilation. You can also connect it below your sink to avoid water runoff. This Portable RV Dump Tank is our top pick from the five products. It comes with two years manufacturer’s warranty and is delivered completely assembled and is available in three sizes which is nice, because the Vans, Weekenderss, and Full-Timers all have an option that is the perfect size.